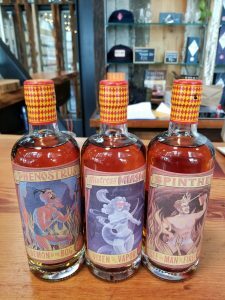 A few months back while planning a Gordon’s Whisky Tasting Seminar, I decided to explore the alternative side of American Whiskey. Ironically, Stranahan’s had always found itself at the top of my list when it came to American Single Malts. I’m not sure if this is because I love their branding and yellow labels or because I love the mountains and have a true infatuation with Colorado. Either way, the Westland story hit me all at once. Not only were they all over the news after the Remy Cointreau purchase late last year, but the East Coast Sales Manager for Westland was quick to contact me when he heard about my class. Just helpful tidbits of information for all of the progressive moves happening at Westland – thanks Chris Riesbeck! Westland soon after became the basis for my west coast trip as well. They are at the forefront and one of the most vocal in the market for TTB regulation and legislation around what American Single Malt means and how to ensure quality. So what does being an American Single Malt entail? Are there any guidelines to follow? When you walk into a liquor store do you want this to be, next to the Single Malt Scotch or over with its fellow Americans? Are the rules for production the same as Single Malt Scotch? All of these questions are still being determined and the unraveling story is quite interesting to watch. 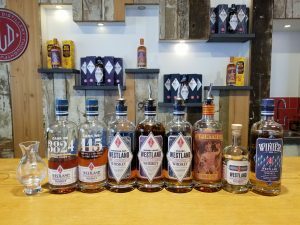 You can find a large amount of Westland’s work and the work of other American Single Malt producers here at the: American Single Malt Whiskey Commission. ​​ Westland Distillery started in 2010 when founder Matt Hofmann and Emerson Lamb bonded together to create Westland American Single Malt. Matt attended Heriot-Watt University in Edinburgh which is something I have thought about many times myself throughout my whisky career. The year 2012 was when the distillery moved to its current, up and coming alternative home of SODO. The building was once a crane factory and it took 18 months to retrofit the industrial facility. 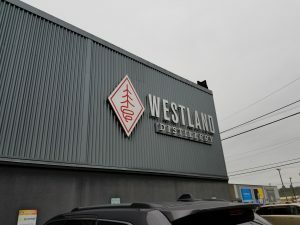 Now Westland is neighbor to many aspiring breweries and cannabis shops. The nickname SODO comes from people shortening this area that is “South of Downtown” and at one point actually meaning “South of the Dome”. In 2013 the first Westland release was unveiled as a 375 mL bottle called The Deacon Seat. Deacon Seat is no longer, but the core product line that Westland has built their reputation around includes American Oak, Sherry Wood and Peated. Each of these have a 5 malt recipe while the peated has a 6th malt. Washington State and its Skagit Valley are known for having some of the most fertile soil on earth proving to be a great location for barley growing. 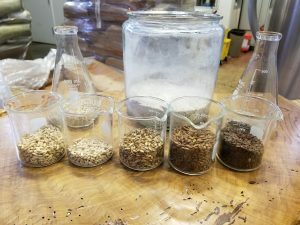 There are maltsters in Washington State that can malt their local grains and then the alternative grains from Europe arrive in bags. All of their peated expressions use heavily peated malt that comes from Bairds Maltings in Inverness. They have a roller mill that can handle all of the milling needs on site. Once the grains are milled they are then moved over to the 5,000 liter stainless steel mash tun. 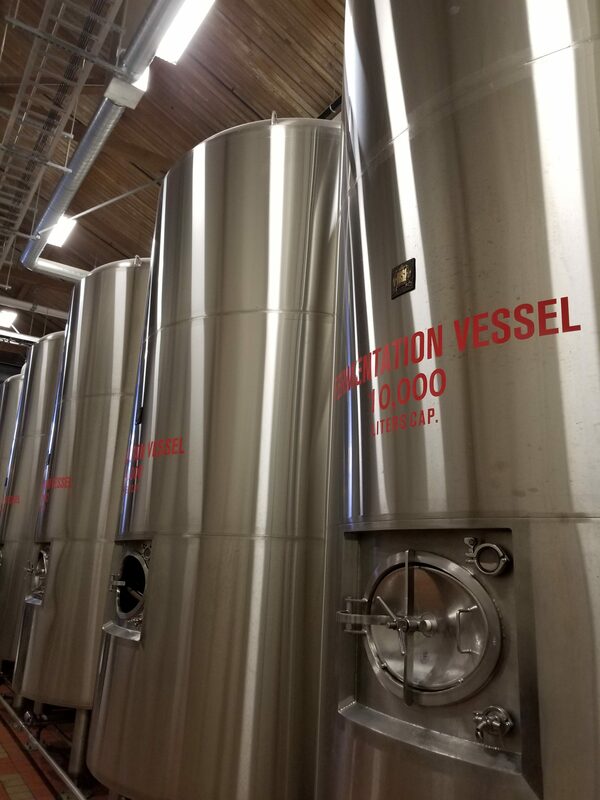 They can run about 2 mashes per day and these two batches of sugary wort that are collected are then transferred to one of the five 10,000 liter fermenters or washbacks. With this production cycle they will typically go through about 5,400 pounds of barley per day. 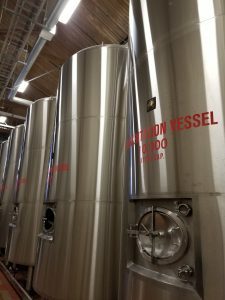 For fermentation they use a Belgium brewer’s yeast that is typically used for saison style beer. I love this style beer, so that perked my ears right up! Typically fermentation will run for about 4-6 days. All of their stainless steel mashing and fermentation equipment comes from Newlands which is a brand name I have not seen yet on any of my distillery visits. Although, both of their pot stills are made by Vendome. There is one wash still and one spirit still. 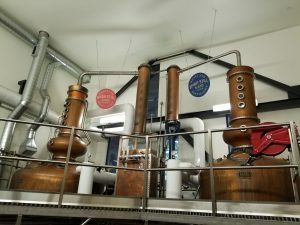 Both are combination stills that have a column on top of the copper pot. 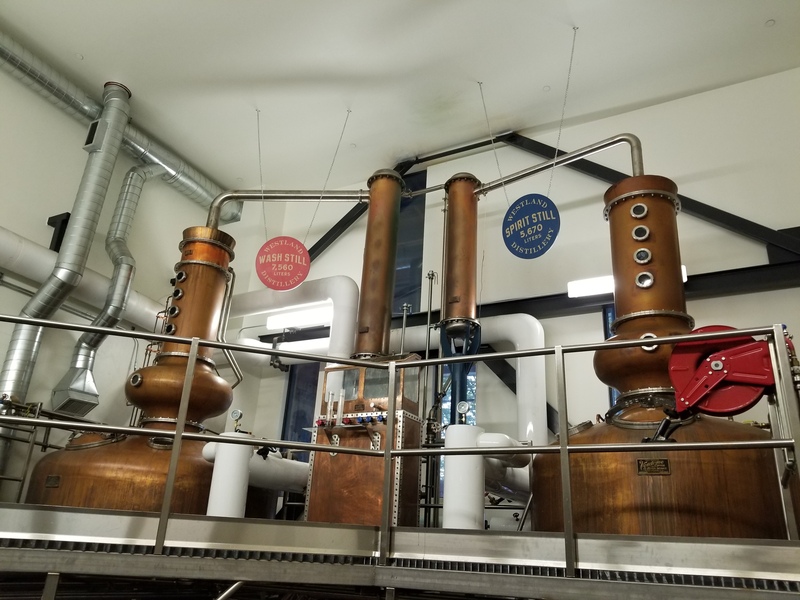 The plates have only been left in place for the wash still, otherwise for the spirit run there is no rectification or column distillation happening. The wash still is 7,560 liters and the spirit still is 5,670 liters. Westland has always utilized regular sized casks and no small cask aging. 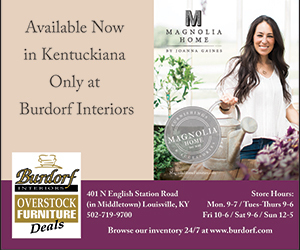 Most of their barrels come from Independent Stave Company. The majority of cask aging and bottling is done in Hoquiam, Washington. This is about two hours south of the SODO distillery location and is nestled right on the Pacific Ocean. Surrounded by the brine and damp humid air of the ocean, the casks tend to have about a 2% angels share in this area. The temperature in Hoquaim will sit at around 50-60 degrees Fahrenheit all year. At the present moment they have over 40 different style casks including sherry, port, Garryana, ex-bourbon and new American oak. The oldest cask in the warehouse right now is of course from 2011. Now let’s talk about what is really starting to create waves in the whiskey community, which is their peat and Garryanna Oak. Right now when we have peated malts here in the United States but that peated malt is coming from either the Islay region or the highlands of Scotland. For many years eager consumers have been hungry for a truly American peated whisky. This is difficult since most of America’s peat bogs and wetlands are under government and state park control. Washington and its coastal regions have acres upon acres of lovely peat bogs. As we all know, peat flavor is determined by what has grown in that region. According to David, the area they would like to harvest is full of cedar, crab apples, Labrador tea, lavender, rosemary and heather. A very herbaceous mix! Not only is Westland in the hunt for access to peat bogs, but they also have the ongoing battle of gaining access to the endangered species of oak called Garryanna. Quercus Garryanna also known as “Garry Oak”, used to range from Northern California to British Columbia. Westland’s website has a great story about their quest for this endangered oak and how they are working to plant new saplings every year. 250 new Garry trees will be planted this year alone. Garry Oak Story as told by Westland. Aged in new American oak and 1st fill ex-bourbon casks. A minimum of 2 years old. Holly’s Review: Nutty with cinnamon and oatmeal. Quite creamy on the palate with apples and cherries. Aged in sherry casks from their partner in Spain. 50% of this blend is aged in Olorosso and Pedro Ximenez sherry casks and married with another 50% that has been aged in new American oak. Aged a minimum of 2 years. Holly’s Review: Raisins, nutmeg along with some buttery spices. Toffee cherries and some chocolate on the finish. Partially peated. Only about 33% peated malt goes into the mash bill making it a total of 6 different barleys for this one. Aged in a combination of new American oak and 1st fill ex-bourbon casks. Holly’s Review: Creamy caramel and some salinity followed by a smokey nut trail mix and vanilla. Garryanna Oak – the latest release of was this year in June 2017. Only 2,600 bottles were released and unfortunately not one made it to Massachusetts where I live now. Peat Week – An actual event at the distillery and literally a full week! It was held this year from October 2nd through the 7th, so I just missed it. It is a cask strength blend of 7 hand selected casks. Five of the casks are new American oak and the other two are 1st fill ex-bourbon. Only 1,500 bottles were released with 3 unique labels. We are expected to get this to Massachusetts. Nose: Cinnamon fireball, some earth and damp oak with a sweet nougat. Palate: Much more floral and the heavily peated malt shows itself. With water more of the apples and pears jump out at you. Single Casks – They have released multiple cask strength single casks throughout the United States. Most display their unique regional area code. My friend Ryan Gilbertie peaked my interest in these releases and I recently had a family member pick up a case of the Pennsylvania State Liquor Boards single cask called 115, only available in PA. I had never tried it but went on Ryan’s recommendation. Low and behold I got to try it at the distillery and Ryan and I now may be in a fight over how many bottles we each get! Holly’s Review.. A mini Balcones Brimstone! So many combating flavors going on in here. Some sweet shines through if you dig with a nutty vanilla ice cream and a dash of ginger spice. What a crazy and delicious whiskey! Although this was the first stop on my West Coast distillery trip, it was the most influential. 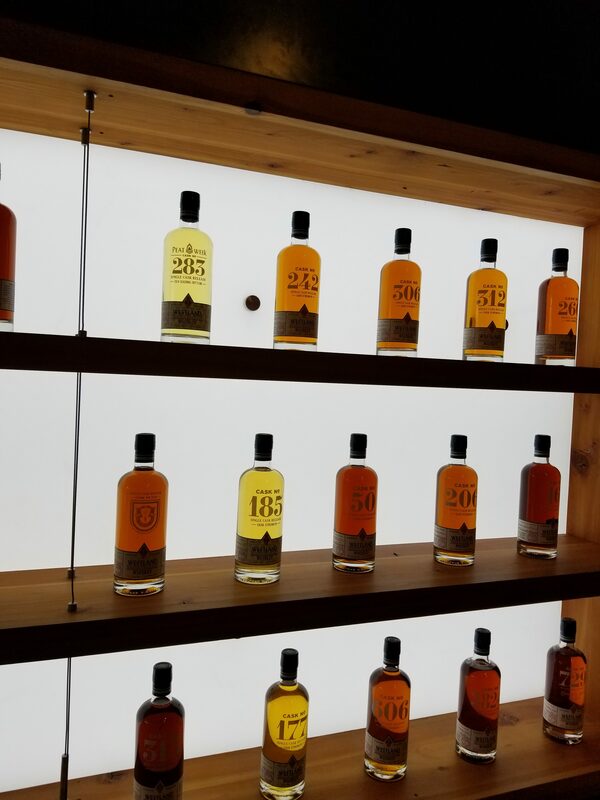 With the amount of milestones Matt Hofmann and team have been able to achieve not only for their own product line and brand, but for the American Single Malt category as a whole is extremely impressive. 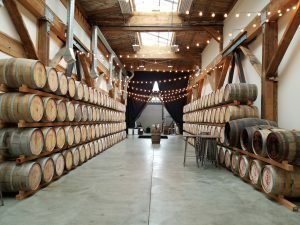 Trailblazing your own category in a part of the country that was never thought of as premier whiskey producers just shows you that the bubble of American Whiskey isn’t going to burst, it is just going to sprout out in new directions. A must visit if you are in the Seattle area and we can’t wait to see how Remy helps them grow! It was while working in design and manufacturing in northern California that Holly’s passion for whisky became too overwhelming. 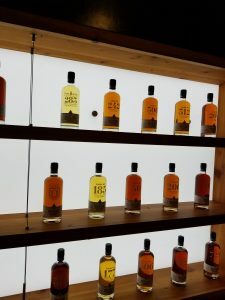 She took it upon herself to create a hands on program for whisky and has since visited some of the largest whisk(e)y producers in the world to spend time with them and learn their ways.